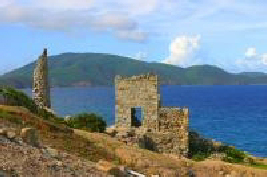 The third largest island of the BVI. In addition to the sheer beauty of the island, travellers are drawn to Virgin Gorda for its yacht clubs, quiet coves, safe anchorages, and luxury resorts. The dramatically shaped island of Virgin Gorda reminded Christopher Columbus of a reclining woman, so he named it Virgin Gorda, the "Fat Virgin." Virgin Gorda measures eight and a half square miles. On the North Sound, the Bitter End Yacht Club, accessible only by water, offers relaxation in an extraordinary, secluded environment. And with its spectacular setting, Little Dix Bay Resort was designed by Laurance S. Rockefeller. Your privacy is ensured at one of Virgin Gorda's deserted pristine beaches, such as Savannah Bay, Pond Bay, Devil's Bay, Mahoe Bay and Spring Bay. Or visit the most popular natural attraction in the BVI, The Baths, where huge granite boulders create mysterious grottoes, saltwater pools, and a connecting trail that entices visitors to spend a day exploring, swimming, and snorkeling. Explore Virgin Gorda on the rugged trails that run throughout the island, and see the huge variety of unique indigenous plants that thrive in the National Parks at Gorda Peak, Devil's Bay, Spring Bay, and the North Sound. At the nature sanctuary at Little Fort National Park, marvel at the exotic birds as they swoop over the hills and ocean. Not surprisingly, Virgin Gorda has been luring people for centuries. Information and photograph courtesy of the BVI Tourist Board. For more detail on the island, that’s a great place to start.